I don't like Valentine's Day. I'd much rather know I'm loved any day of the year than one day that everyone else is supposed to show their love too. But I do like making pancakes and shaping them funnily. My dad used to make shaped pancakes in such brilliance as our initials or as a mouse. This is how I became "Meggie-Mouse" most of youth, unfortunately. My mom made pancakes every Sunday she could and we always, always, always had real Vermont Maple Syrup. She even brings her own syrup to restaurants that don't serve the real deal. 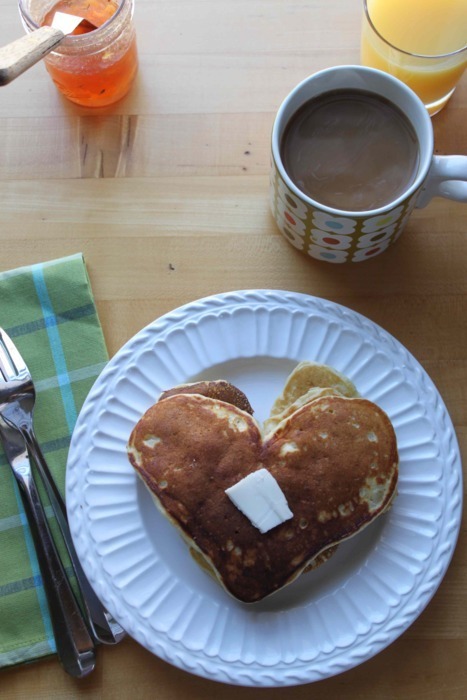 So pancakes, love, there is a real connection. At least in my world. Melt the butter in a large non-stick skillet over medium heat. Cook until the butter foams, the foam browns and sinks to the bottom of the pan, about 2 minutes. Remove the butter from the pan and set aside to cool while you assemble the rest of the ingredients. Whisk together the flour, baking powder, baking soda and salt in a large bowl. Combine the sugar, egg, buttermilk and butter in a medium bowl. Add the wet ingredients to the dry, mix gently, then rest for 10 minutes. Heat the non-stick skillet over medium heat. Scoop 1/2 cup of batter into the pan and cook, 2 at a time, until the edges are dry and bubbles are appearing, before flipping. Cook until golden on the other side. Keep warm in a 200˚F while repeating with the remaining batter.